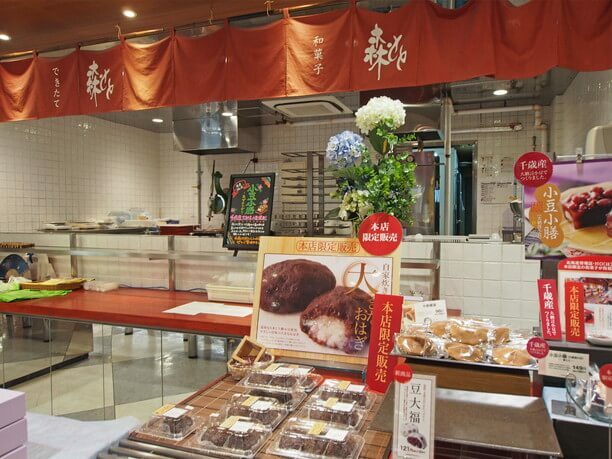 “Morimoto” at the Shin Chitose Airport is famous for its souvenirs and specialty sweets, such as “Yukimushi Souffle”, “Husk Cup Jewelry”, “Jelly full of Jelly”. Their “Morimoto made” candy, bread, and dessert are made with carefully selected ingredient. Their head office is in Chitose city (known as Hokkaido ‘s sky entrance). In addition to these popular items, Morimoto head office is full of attractive sweets, bread and desserts including limited edition items. 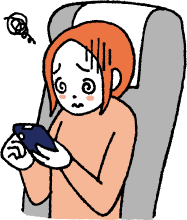 The popular cartoonist Mari Yamazaki(ヤマザキマリ) who is famous for “Thelmae Romae” drew their package illustrations. 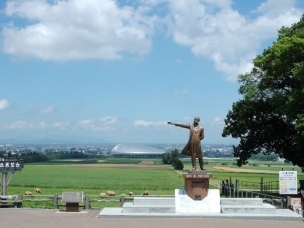 Located 7 minutes on foot from the JR Chitose Station, this is the place where Morimoto was born! 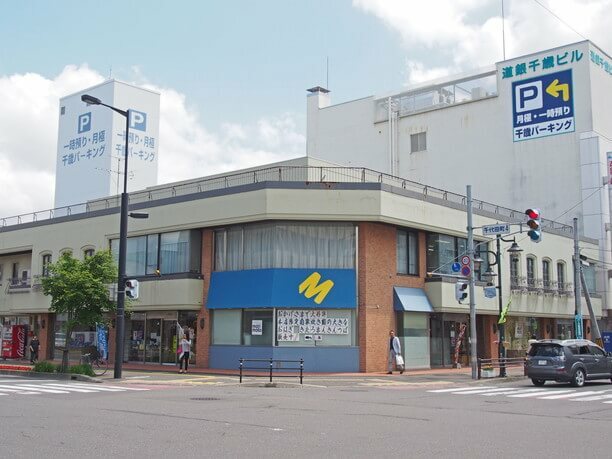 Morimoto head office is a 7-minutes walk from JR Chitose Station. Walking straight to the Odori station you will see the store occupying a large part of the intersection. In the era of post-war food shortages, the store started as a place where bread and sweets were delivered. 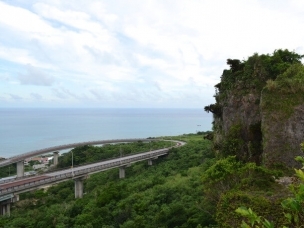 It has continued as a place loved by the locals for more than 70 years. 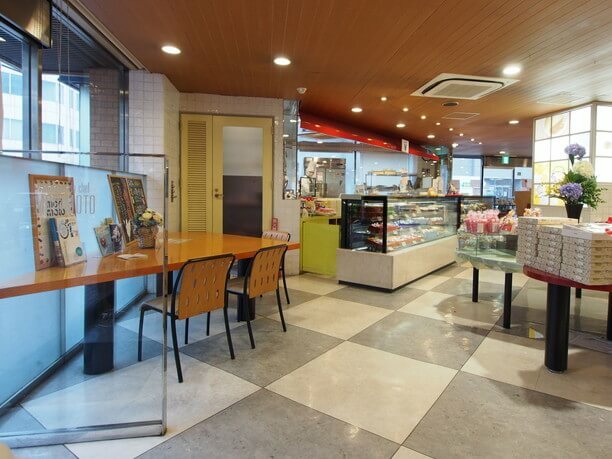 Within the shop, there are not only plenty of standard items such as sweet and sour Husk cup jam, buttercream, chocolate matched cookies, “husk cup Jewelry” and “Yukimushi Souffle,” but also of plenty of seasonal items and new sweets. They have a lot of cakes that you would like to eat on the spot. 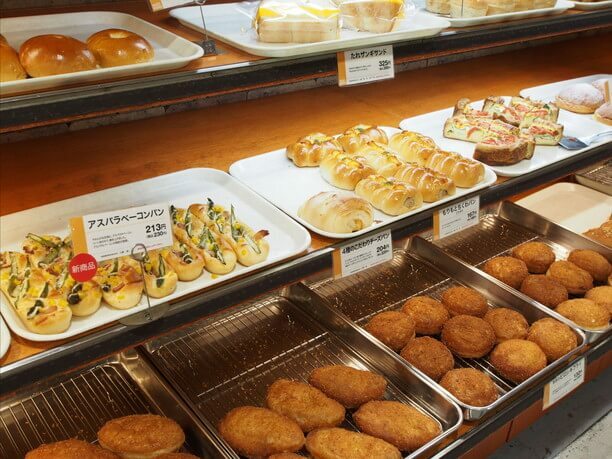 Their Japanese sweets, and bread are very fulfilling. They also sell soft serve ice cream. 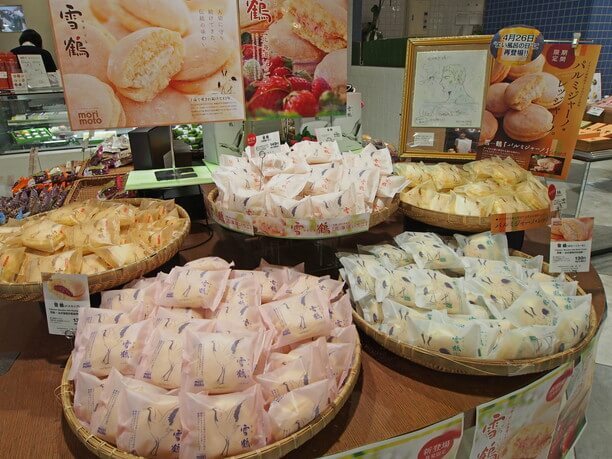 The most popular sweets at their head office are the longtime best-selling snow crane (140 yen ~ 160 yen). It has been selling well for over 40 years. It is a signboard product of the Morimoto, and it is familiar to Chitose citizens for home use and gifts. Mari Yamazaki Mari drew the illustrations, for the Snow Crane! 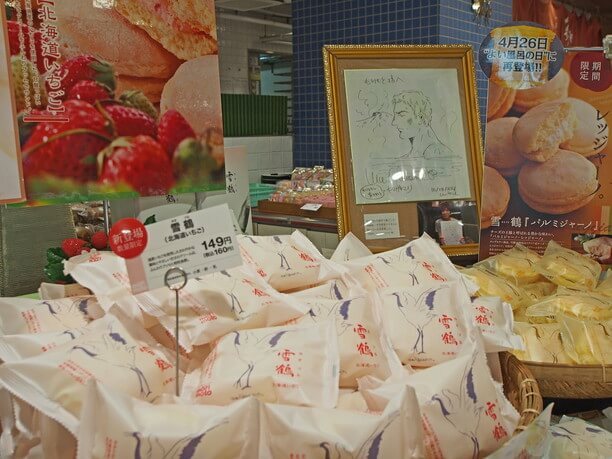 Above is a picture of the Almond Snow Crane, which is only sold in the Chitose area. It is fluffy and light, made with flour and eggs with plenty of cream, rich almonds and caramel. There are five kinds in all, including crispy butterfly bitterness, a sweet and sour husky cup, parmigiano (using Italian aged cheese) and Hokkaido strawberries. You can get lost trying to choose which of Morimoto’s cakes or other desserts to eat! 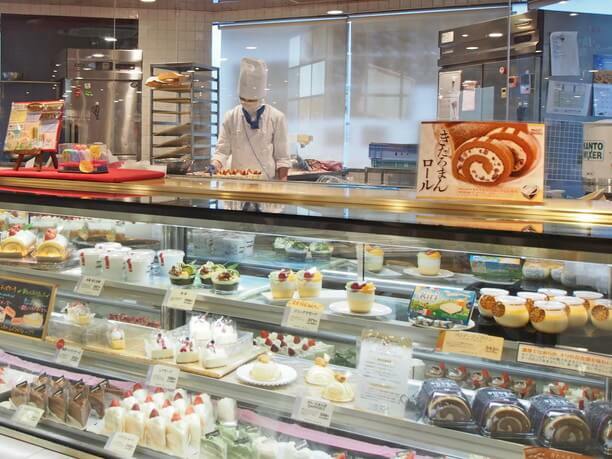 There are cake counters at the headquarters and at the 26 stores in Hokkaido (excluding Shin Chitose Airport store). 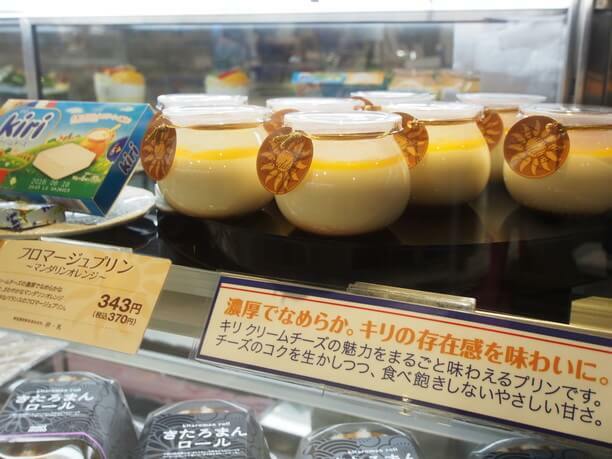 The bottom picture is of the “Fromage Mandarin Orange Pudding (370 yen) which is also selling at the Shin Chitose Airport shop. Its refreshing orange sauce goes well with the thick, smooth pudding of cream cheese. 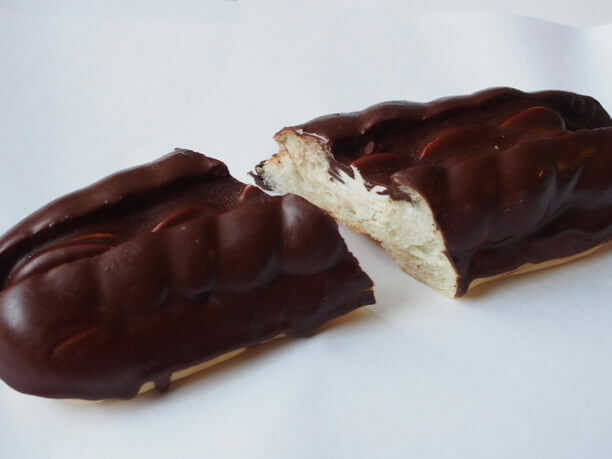 It is a dessert that won a bronze prize and the “Mart reader judge special award” at “Kiri Cream Cheese Competition 2015”. 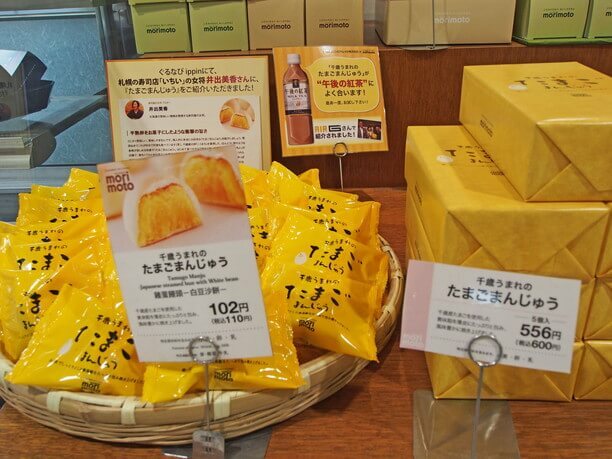 “Hokkaido Gem Fruit Jelly” is also popular for souvenirs and gifts. It is in a pretty package drawn by a picture book writer Sora. 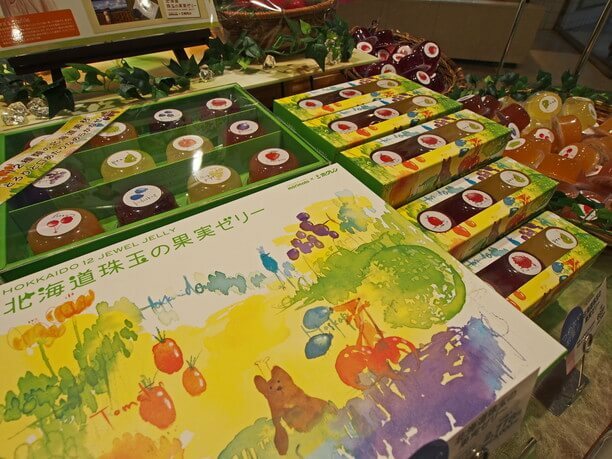 It has twelve kinds of colorful and flavorful jelly using materials made in Hokkaido such as western style, tomato, red tofu, melon etc.. An assortment of 3 pieces (750 yen) is also popular. 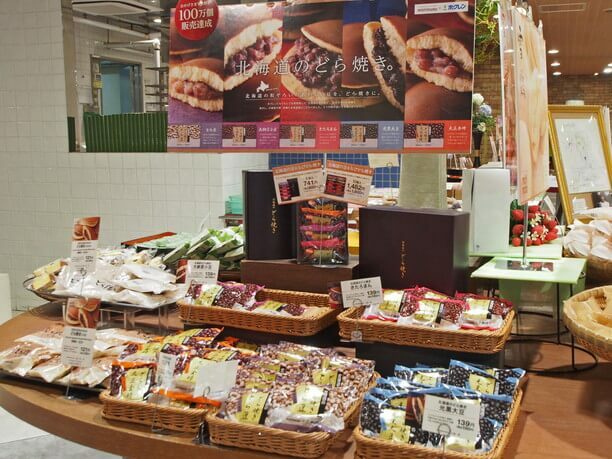 Morimoto produces about 40 different kinds of Azuki bean treats! 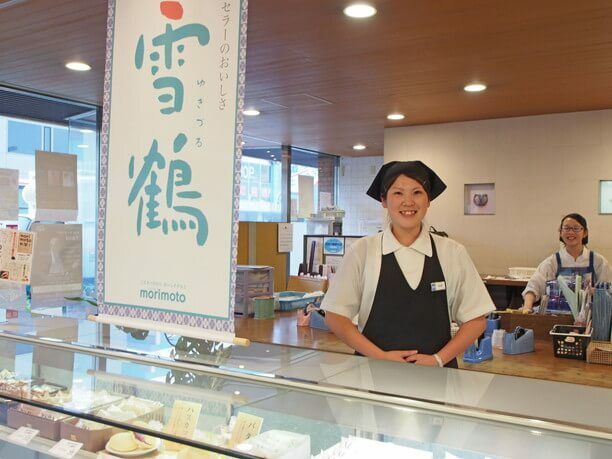 The image of the store makes people think that most of their confectionery is a foreign treat, but in reality there many local fans who think “Japanese sweets are the only thing.” Morimoto makes 40 different kinds of bean treats. They are committed to cooking their bean-made treats properly for each product. The head office’s limited edition “big ohagi” (120 yen per piece) is a big size, as the name suggests. It is a delicious treat that uses sweet potato glutinous rice with azuki beans from Tokachi. 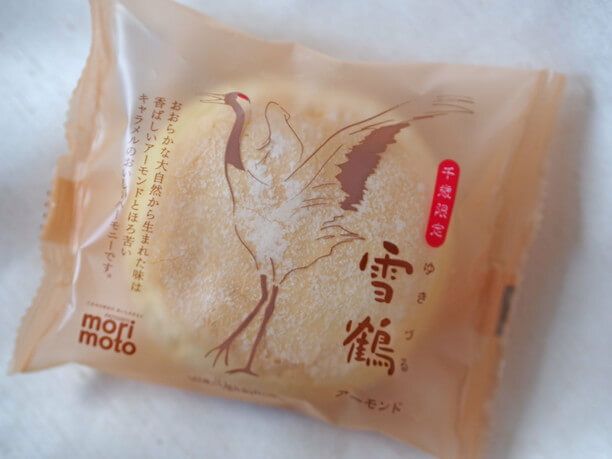 There are five kinds of dorayaki which use beans to make such products as Daito Azuka Bean (Azuki), Light Black Soybean, Taisho Kinpo etc., “Dorayaki no Hokkaido” (150 yen). They are made in co-development with the Hokuren company. They make lots of bread that you will love! The variety of bread is substantial. In addition to the classic bread, there are also lineups including Menu Spicy Mentaiko (180 yen), Asparagus Bacon Bread (230 yen), Sanga Zangi Sand (350 yen). 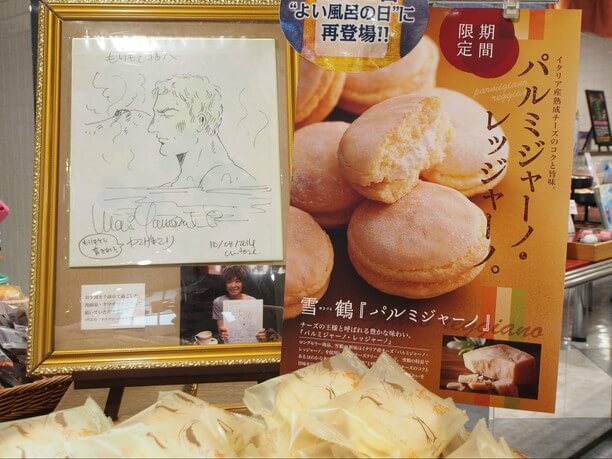 Above is a picture of their Chamonix (140 yen) with plenty of cream on French bread dough. You can buy their bread to take home or eat in. So why not come in and see the sweets and bread of the main shop, that is loved by the locals. 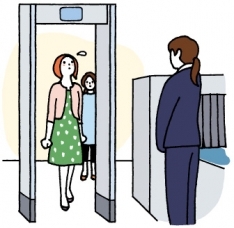 It is convenient because it is accessible 7 minutes on foot from JR Chitose station and there are 31 car parks. Since it is open from 8:00 am it is possible to buy breakfast bread. Because there is an eat-in space, you can eat Ohigi, bread and pudding that you can not take away from the shop. They also sell soft serve ice cream. The bun manju (Manju) wrapped in kozo with azuki beans and brown sugar costs 300 yen for 20 pieces. It seems that local people will often buy it. At the Morimoto 's bread corner, the petit bread is extremely popular. 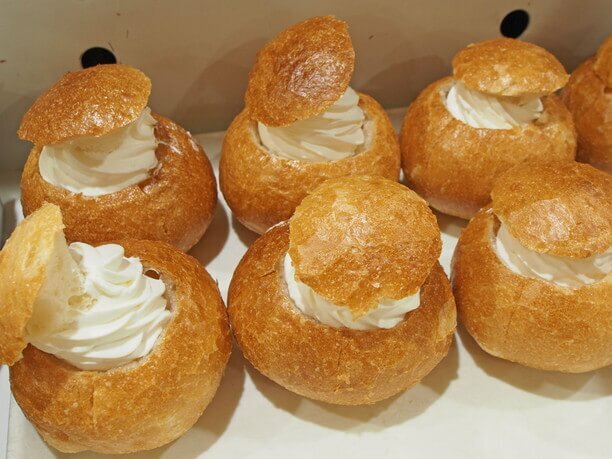 You can choose from sweet bread such as mini croissants and melon pans to delicatessen bread such as currenan. 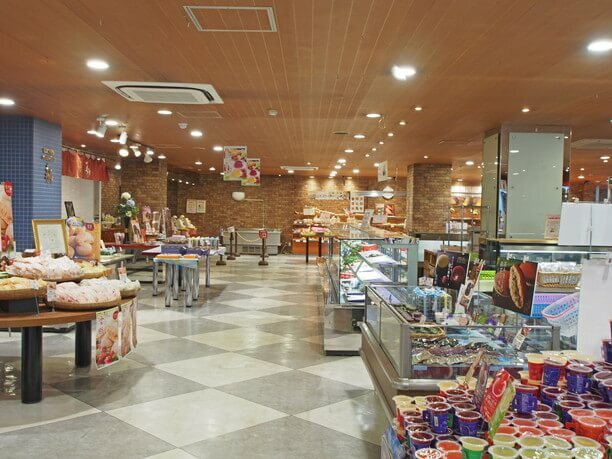 Enjoy spending time at the Rokkaitei Obihiro head office with their amazing selection of sweets! Enjoy large sweet potatoes at the Obihiro Cranberry head office!